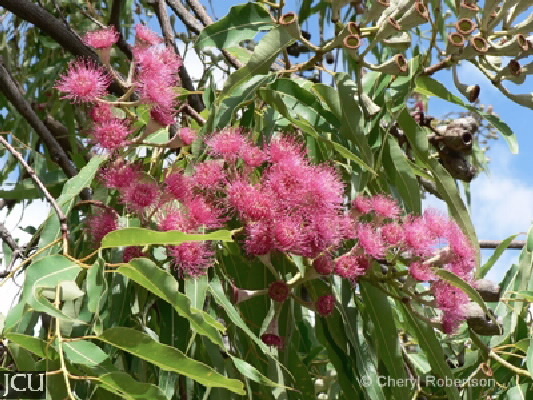 Originally found in gallery forests in Western Australia and the Northern Territory, this species is now commonly grown as a street tree. A crooked tree that tends to ‘flop’ when young, it often has drooping branches. The lanceolate, leathery leaves are up to 30 cm long and 7 cm wide, the midrib is pale yellow in contrast to the green lamina and the lateral veins tend to be parallel to one another. The flowers are borne in large clusters on the outside of the tree. Colour forms range from very pale to dark pink, these are followed by large woody capsules to about 4 cm long. Flowering chiefly in summer and autumn, but some flowers may be present in any month.